One problem with earthquakes is that stress continually builds up until released. When the pressure is close to release, even a small cause can trigger the inevitable. Perhaps a week or month, or year sooner than the pressure build up would of done anyway. For those who are wondering whether the water from a 2m SLR by 2091 would be uniformly distributed around the world and its tectonic plates, then you can mentally combine the image in panel (d) for RCP 8.5 from AR5 together with an additional meter of water height from the WAIS distributed according to the fingerprint effect shown in the second attached image. Clearly, such a water distribution would apply non-uniform stress on different tectonic plates (thus promoting additional future seismic activity). Also, note that as most of the land surface would not be gaining mass due to such SLR (and in glacial areas would be losing mass); there would be additional differential stress on the tectonic plate margins due to this mass imbalance as well. Climate may influence earthquakes (eventually) but earthquake certainly have an effect on climate. The checking of the himalaya glaciers should not be so good for their stability...? As a follow-up to my Replies #44, #46 & #48, while the GRACE image in Reply #44 shows that Eastern portions of the Himalayas have recently (2003-2010) been receiving more than normal snowfall; the following peer reviewed reference indicates that the Western and Central portion of the Tibetan Plateau glaciers have been starved of recent snowfall to the extent the two studied glaciers have sustained annual ice loss rates of more than several hundred millimeters of water equivalent since at least the 1980's (see the two associated images). Also, we know that worldwide mean surface temperature increases are occurring faster at high mountain elevations, and the Himalayas are no exception. Therefore, I expect ice mass loss from the Western & Central Tibetan Plateau to accelerate in the coming decades, and the associated mass loss could change local tectonic plate stresses sufficient to trigger more frequent seismic events in this area in this timeframe. Kang, S. C., Wang, F. Y., Morgenstern, U., Zhang, Y. L., Grigholm, B., Kaspari, S., Schwikowski, M., Ren, J. W., Yao, T. D., Qin, D. H., and Mayewski, P. A.: Decapitation of high-altitude glaciers on the Tibetan Plateau revealed by ice core tritium and mercury records, The Cryosphere Discuss., 9, 417-440, doi:10.5194/tcd-9-417-2015, 2015. Abstract: "Two ice cores were retrieved from high elevations (~ 5800 m a.s.l.) at Mt. Nyainqentanglha and Mt. Geladaindong in the southern to inland Tibetan Plateau. The combined analysis of tritium (3H), 210Pb, mercury tracers, along with other chemical records, revealed that the two coring sites had not received net ice accumulation since at least the 1950s and 1980s, respectively, implying an annual ice loss rate of more than several hundred millimeter water equivalent over these periods. Both mass balance modeling at the sites and in situ data from nearby glaciers confirmed a continuously negative mass balance (or mass loss) in the region due to the dramatic warming in the last decades. Along with a recent report on Naimona'nyi Glacier in the Himalaya, the findings suggest that glacier decapitation (i.e., the loss of the accumulation zone) is a wide-spread phenomenon from the southern to inland Tibetan Plateau even at the summit regions. This raises concerns over the rapid rate of glacier ice loss and associated changes in surface glacier runoff, water availability, and sea levels." Therefore, I expect ice mass loss from the Western & Central Tibetan Plateau to accelerate in the coming decades, and the associated mass loss could change local tectonic plate stresses sufficient to trigger more frequent seismic events in this area in this timeframe. ASLR provides lots of interesting links about changes in vertical loading which are expected to accelerate. However, in judging their importance for changes to seismicity, there needs to be a quantitative consideration of these loading/unloading effects on vertical stress, how these compare to changes in horizontal stress from plate tectonics, and hence what controls differential stress change on potential fault planes at depth. The GRACE mass changes quoted by ASLR are a few cm of snow. The lnk provided by Laurent #52 to the BBC report of vertical changes in elevation following the Nepal earthquake. Almost instantaneous changes in elevation are of the order of 1m to 1.5 m These elevation changes are two orders of magnitude greater than the unloading effects from ice/snow loss over the last 10 years. These elevation changes are linked to the instantaneous variation in horizontal crustal stresses resulting from the fault plane slip, whcih have orders of magnitude greater variation than changes in vertial stresses through unloading. Therefore it is the cyclical variation in horizontal stresses resulting from plate tectonic motion which determines the destructive earthquake behaviour in the Nepal region. I think it is clear that quantiitative considerations show that man-made climatic change is not the dominant factor controlling frequency of occurrence of destructuve seismicity in the Himalayas. Of course, expected significant changes, consequent on anthropogenic global warming, to Himalayan glaciers and resulting river hydrology have other, potentially very significant detrimental consequences for people living in south and central Asia. I imagine that folke_kelm must be pre-occupied doing something else today; otherwise, with his love of logical rigor I am sure that he (she?) would point-out the numerous portions of your reply that are logical red-herrings. First, no one that I am aware of in this thread (certainly not myself) have claimed that the influence of climate change dominates tectonic activity, with regard to the Nepal earthquake or anywhere else in the world. The influence of climate change can be viewed as a possible stress riser added on-top of the otherwise dominant tectonic forces (any other thought is ludicrous and would only be thought by individuals with a poor understanding of science), that indeed vary from site to site and on the local tectonic history and boundary conditions. In this light, anthropogenic forcing (such as Indian groundwater mining, in Northwest India, to compensate for low rainfall and high population growth) can act as a trigger to increase the frequency and/or magnitude of seismic activity dominated by tectonic forces. Thus it is a "straw-man" to say that because the influence of anthropogenic forcing does not dominate seismic response that the influence of anthropogenic forcing will not have a systematically growing impact (which will be different in different locations) on seismic activity this century, with continued anthropogenic forcing. (a) the Northwest Indian groundwater mass shown in the white box of the first attached image; which, resulted in the over 20 cm change in equivalent water height from 2003 to 2012 shown in the second attached image; and which, amounts to a loss of hundreds of gigatonnes of cumulative water mass (over these years) as indicated by the previously posted third attached image. See the Chen et al 2014 reference at the end of this post. (c) the loss of glacial ice in the Western & Central Tibetan Plateau cited by Kang et al 2015 in Reply #53. … I am confident that their cumulative influence (plus what happened from 2012 to 2015) is not negligible. Finally, you should not compare the elevation changes of portions of the Himalayas (cited by Laurent) after the Nepal event to the different equivalent water height changes in groundwater, snow and glacial ice; as this is comparing apples to oranges. Chen, J.L., J. Li, Z.Z. Zhang, S.N. Ni, Long-Term Groundwater Variations in Northwest India From Satellite Gravity Measurements, Global and Planetary Change, Vol. 116, 130-138, doi: 10.1016/j.gloplacha.2014.02.007, 2014. First, no one that I am aware of in this thread (certainly not myself) have claimed that the influence of climate change dominates tectonic activity, with regard to the Nepal earthquake or anywhere else in the world. The influence of climate change can be viewed as a possible stress riser added on-top of the otherwise dominant tectonic forces. I am glad we agree that tectonic activity is the dominant control on frequency and magnitude of earthquakes globally. I use the example of the recent Nepal earthquake to show that the "stress riser" from climate changes referred to is insignificant for magnitude and frequency of large earthquakes in this part of the world. I also agree with previous posts that where there is localised, rapid, very large-scale unloading from disintegration of ice-sheets, then local seismic activity will normally increase. One common property of apples and oranges is that they both transmit a vertical stress to the surface they are sitting on in proportion to their mass. It is entirely fair to compare the vertical stress resulting from 1m of rock of density approx 2600 kg.m-3, with that of 3 cm of ice/water of density approx. 1000 kg.m-3., or with 20cm of groundwater in rocks of average porosity of, say, 15% also with density of approx 1000 kg.m-3. Vertical stress changes from the loss of groundwater or of ice/snow over 10 to 20 years is roughly two orders of magnitude smaller than the instantaneous vertical stress change revealed by the topographic change caused by the earthquake. The points that you make about the dominance of tectonic forces have no more meaning than saying that climate still dominates climate change. The Earth does not care what climatic, or tectonic, state that it is in; it is modern human society that is poorly prepared to deal both with change to the climate and to changes in the magnitude and frequency of seismic activity triggered by anthropogenic forcing. Charles Darwin once said: "It is not the strongest of the species that survive, nor the most intelligent, but the one most responsive to change." Furthermore, the Bible points out that: "Blessed are the meek: for they shall inherit the earth." In light of such received wisdom, it seems to me that society would do well to stop focusing on the "dominance" of climate compared to current climate change, or the "dominance" of tectonic force compared to associated anthropogenic forcing; and instead focus on how poorly prepared its own systems (economic, technological, institutional, governmental, etc) are for address all of the numerous "stress risers" associated with anthropogenic forcing, including the accelerating pace of changes to the frequency/magnitude of tectonic activity associate with anthropogenic activity. The linked article discussing the case that fracking maybe causing swarms of small earthquakes in Texas (see the extract below). This thread cites numerous other cases associating swarms of small earthquakes in North America associated with fracking, and it should be noted that fracking operations are still ramping-up in many other areas of the world (North America just had a head start on the rest of the world). Many people will think: "What's the problem with swarms of small earthquakes? People are adaptable, and having the locals suffer such small earthquakes is a small price to pay for the market (and me) to gain access to these valuable fossil fuels." Unfortunately, besides the accelerated groundwater contamination and the GHG emissions; such swarms of such small local earthquakes can accumulate tectonic stresses in the rock of adjoining areas. Therefore, as fracking operations spread around the world, tectonic stresses will be accumulated in the rock of adjoining areas at multiple locations around the world. Therefore in the future, large earthquakes (dominated by natural tectonic action) may likely trigger moderate sized aftershocks in these adjoining areas with accumulated tectonic stresses, which may be large enough to cause structural damage and loss of life. Furthermore, in the future climate change associated damage may have overtaxed to insurance industry to the point that it makes earthquake insurance premiums so high that they are unaffordable to the general public, and if so the public may need face the consequences of future seismic damage will much less societal assistance then they are currently used to believing that they are entitled to. Also, I note that when the international insurance industry gets over-stresses they pass of higher premiums to everyone in the modern society, including to people living far away from places subjected to high risks (whether from more frequent strong earthquakes, or more frequent flooding, etc.). Extract: "What do scientists say? The problem isn't solely the drilling, some scientists argue. It's the disposal of a wastewater byproduct of the drilling. The way most companies dispose of this byproduct is to push it thousands of feet underground. The mixture of millions of gallons of water and potentially harmful chemicals are pumped into the earth's crust, and the liquid lubricates the faults, causing the earth to shake, or so the theory goes. A key point in SMU's preliminary report is about the depth of these earthquakes, which have been 3 to 4 miles deep. This places most of them "in the shallow crystalline basement (granites) below the sedimentary rocks (sandstone, shale, limestone, etc.) that comprise the Fort Worth Basin." An injection of wastewater that reaches the granite basement can agitate an existing -- or previously unknown -- branch of a large fault, resulting in the ground shaking." Steve Drury's Earth Pages has an article on Earthquake hazard news that focuses on petroleum industry fluid injection wells. The main worry is that waste water disposal might trigger movements with magnitudes up to 7.0: in 2011 a magnitude 5.6 earthquake hit a town in oil-producing Oklahoma and damaged many buildings. None of these areas are likely to experience the horrors of the 25 April 2015 magnitude 7.8 earthquake in Nepal. However, it also occurred in an area expected to be relatively stable compared with the rest of the Himalayan region. The only previous major tremor there was recorded in the 14th century. This supposedly ‘low-risk’ area overlies a zone in which small tremors or microearthquakes occur all the time. Such zones – and this one extends along much of the length of the Himalaya – seem to mark where fault depths are large enough for displacements to take place continually by plastic flow, thereby relieving stresses. Most of the large earthquakes have taken place south of the microseismic zone where the shallow parts of the Indian plate are brittle and have become locked. The recent event is raising concerns that it is a precursor of further large earthquakes in Nepal. Its capital Kathmandu is especially susceptible as it is partly founded on lake sediments that easily liquefy. In general there might be a connection between ground water depletion and a region becoming less 'plastic' (allowing for fewer but larger earthquakes). I don't think this happened in Nepal though: groundwater depletion happens in the upper 1 or 2 kilometers of the crust whereas the decreased plasticity (if that is what happened in Nepal last month) happened about 15 km down. I note that lower plasticity can also be a function of higher rate of loading; and as the change in groundwater elevation in Northwest India was not directly above Nepal's 2015 epicenter; it makes much more sense to talk about the rapid change in hundreds of gigatonnes of water weight on the Indian tectonic plate rapidly changing the stress in the fault beneath Nepal rather than talking about changes in groundwater at the fault (which likely did not happen). To state the obvious, most scientists have become highly specialized in our current reality; but with regard to the possible impacts of climate change on tectonic activity, there currently is no entity that I am aware of that takes responsibility to integrate all of the various risks associated with different mechanisms into an integrated whole synergistic projection; in a similar manner as GCMs or ESMs do for oceanic, atmospheric and other associated Earth Systems. This leaves the risks associated with anthropogenic changes to this tectonic activity relatively poorly evaluated. The present study focuses on the Amundsen Sea sector which is the most dynamical region of the Antarctic Ice Sheet (AIS). Based on basin estimates of mass changes observed by the Gravity Recovery and Climate Experiment (GRACE) and volume changes observed by the Ice, Cloud and Land Elevation Satellite (ICESat), the mean mass change induced by Glacial Isostatic Adjustment (GIA) is derived. This mean GIA-induced mass change is found to be 34.1 ± 11.9 Gt/yr, which is significantly larger than the predictions of current GIA models. We show that the corresponding mean elevation change of 23.3 ± 7.7 mm/yr in the Amundsen Sea sector is in good agreement with the uplift rates obtained from observations at three GPS sites. Utilising ICESat observations, the observed uplift rates were corrected for elastic deformations due to present-day ice-mass changes. Based on the GRACE-derived mass change estimate and the inferred GIA correction, we inferred a present-day ice-mass loss of − 98.9 ± 13.7 Gt/yr for the Amundsen Sea sector. This is equivalent to a global eustatic sea-level rise of 0.27 ± 0.04 mm/yr. Compared to the results relying on GIA model predictions, this corresponds to an increase of the ice-mass loss or sea-level rise, respectively, of about 40%. The first accompanying figure shows an overview of the Amundsen Sea sector, West Antarctica. The red line defines the generalised drainage basins of Pine Island Glacier, Thwaites Glacier and Smith Glacier (PITS). Locations of three GPS campaign sites are marked by red triangles. For those who are not clear about the implications of the information that I posted in Reply #62, the GRACE satellite only measure mass change, so if ice mass is leaving the Amundsen Sea Embayment, ASE, but magma is flowing back-in underneath the lithosphere, then the uncorrected GRACE measurements may be underestimating the true amount of ice mass loss. Unfortunately, it is not well understood how quickly the magma is flowing back underneath the ASE, so there currently is a monitoring effort going on to try to reduce the uncertainties associated with this mechanism. If a lot of magma is flowing in to the ASE area, then not only are the current SLR projections erring on the side of least drama, but so to are the current seismicity projections for this ASE area. That flow of magma should be measurable by sismic devices ? Do we know the records of these devices in the area ? I have heard that some scientists in Yellow stone use a special technic to assess the flow of magma...may be that can help us to assess what is going in Antarctic ? Abstract: "The POLENET-ANET project is simultaneously resolving crustal motions, measured by GPS, and Earth structure and rheological properties, mapped by seismology. Measured vertical and horizontal crustal motion patterns are not explained by extant glacial isostatic adjustment (GIA) models. These models have ice histories dominated by ice loss following the Last Glacial Maximum (LGM) and rely on 1-D Earth models, with rheological properties varying only radially. Seismological results from POLENET-ANET are revealing significant complexity in lateral variation in Earth properties. For example, crustal thickness variations occur not only across the East-West Antarctic boundary, but also between crustal blocks within West Antarctica. Modeling of mantle viscosity based on shear wave velocities shows a sharp lateral gradient from high to low viscosity in the Ross Embayment, a much more gradual gradient in the Weddell Embayment, and very low viscosities below Marie Byrd Land and the Amundsen Sea Embayment (ASE). Remarkable vertical and horizontal bedrock crustal motion velocity magnitudes, directions and patterns correlate spatially, in many aspects, with Earth property variations mapped by seismology. Within the ASE, extremely high upward velocities are flanked by subsiding regions – neither predicted by GIA models. Given the thin crust and low mantle viscosity, it is likely that this is not an LGM signal, which would have already relaxed, and uplift due to the elastic response to modern ice mass change clearly is important. As in other regions where rapid GIA-induced uplift has been measured, the crustal velocities in the Amundsen Embayment may also record a viscoelastic response to ice loss on decadal–centennial timescales. Along the East-West Antarctic boundary in the Ross Embayment, GIA-induced horizontal crustal motions are toward rather than away from the principal ice load center, correlating spatially with the strong lateral gradient in mantle viscosity. In the Weddell Embayment region, where crustal thickness is intermediate between East and West Antarctica and mantle viscosity values are moderate, crustal motions show the best match with predictions of GIA models. It is clear that lateral variations in Earth properties fundamentally control the isostatic response to ice mass changes in Antarctica. Ongoing integrated seismic-GPS studies are critical to developing the next generation of GIA models."" A second major earthquake (not an aftershock) hit near Everest base camp today with a Richter magnitude of 7.3. This may all just be nature or anthropogenic forcing could be acting as a stress riser (for frequency of return period and/or magnitude). This page also gives a discussion of the underlying causes of large earthquakes in the region and their repeat times. I'll see if I can track down one of his posts on this issue in particular. It seems to me that SLR, in particular, must have some effect on pressure on tectonic plates at some point. Hej wili, thanks for the nice introduction, but m I obsessed with the idea? Basically the idea that there will be response from the Earth, due to isostatic rebound appears plausible, in particular from unloading of active faults. Btw. all the stuff should be still there @CS, not sure what you were looking for. I imagine that folke_kelm must be pre-occupied doing something else today"
Indeed, i am occupied with other things most of my time, there are some small children and a job has to be done dealing with risk assessment and groundwater chemistry and some education too. I am reading daily, but there is simply no time to write a comment, so please excuse me when i do not answer immediately. I do not think that the discussion here has moved to some point of conclusion, at least not from my point of view. I still see some misconceptions about earthquakes, how they happen and why. At first we have to distinguish between different geological phenomena cimate change is able to influence. There are 1: slides 2: eruptions and 3: earthquakes. All 3 may react to climate change in different ways. At first we have to consider about, what climate change possibly is able to change. You ASLR; have provided us with a bunch of links, that give us an answer about this question. Climate change is changing is rising the sea level, not equal but regional different, thus changing the vertical stress on plates, and human influence (not only climate change) is changing ground water level and again the vertical stress on plates. There is n discussion at all necessary about this fact. Let us have a look at the consequences of this vertical stress change. 1: we begin with slides. Here the limiting factor is internal cohesion (friction) inside the rock or sediment. This friction is strongly dependend of fluids in the free space between grains, in other words pore water pressure. Increasing rain and rising ground water level will cause increasing pore water pressure and thus deminishing the internal friction, causing less shear stability of the rock. A slide may be the result as is seen frequently in California during El Nino years with increased rainfall. 2: Volcanism is always caused by vertical movement of hot mantle material or fluid rich partly melted masses from subducting in zones, where plates are recycled into the mantle (ring of fire) or in zones where crustal stretching takes place (mid ocean ridges). In all cases we must take attention to the most important factor to generate liquid magma, pressure (static, not dynamic). Liquid magma is, as i wrote earlier, generated when pressure is released, and only liquid magma is able to erupt. The most important factor to release pressure is movement of plastic or fluid rich plastic mantle or crust material upwards in the crust. At a distinct pressure level the material will melt suddenly. this level is different for every material and every volcano. You may translate pressure to a vertical stress, and now you see, that a melting ice cap, a melting glacier and if you want, draught and depleting of ground water will reduce pressure. IN the case of ice caps this will be at a rather high level. But, please have in mind, that you must have material that is able to melt. Melting the ice cap has not caused any volcanic eruption anywhere in northern europe, it will not cause any eruption at the most places where we have ice caps today, simply because it will not move hot masses in the mantle. These movements take 10´s to 100´s of million years and they occure totally independend of any climate. You see, a change in vertical stress can be caused by climate change. Let us now look at earthquakes. Here i disagree completely with the idea that climate change may cause an increase in frequency AND strength of earthquakes, let me explain why. Nearly all earthquakes worth mentioning are caused by plate tectonics. The different parts of the crust move independly over the more plastic deformed upper mantle. We know nowadays that the motor of this movement mostly is the pulling force of the subducting slab, not the pushing force of generating crust at mid oean ridges. This movement of plates create a nearly pure horizontal stress at places, where parts of crust with different velocities meet. These are mostly transform or strike-slip faults (it does not really matter which type). The horizontal stress generates elastic strain at places where the two plates are locked. The relation between plate movement and rising elastic strain is nearly linear. If you consider the plate movement as constant (it nearly is), then you see, that the buildup of strain is a result of two variables, the plate velocity and the time of locked movement (no movement at a certain place). The longer the time the bigger the quake. Is climate change in form of rising sea level or changing ground water level capable to increase horizontal stress? This is the only possibility to add energy to the system of locked elastic strain. If a changing load is not providing horizontal stress, it may nevertheles influence the magnitude or the frequency of earthquakes, but in a different way. If a vertical stress component breakes a lock (or increased fluid pressure in the shear zone), the strain will be released as earthquake BEFORE it will occure naturally, and so it will have a lesser magnitude. The way plate tectonics work is only able to react with diminishing magnitude and higher frequency or, if you provide a stronger locking, with higher magnitude but fewer quakes. Higher vertical stress due to changes in water level is not at all able to provide more energy to the system, it can only change the way this energy is released. Earthquakes due to isostatic rebound from removing icecaps are entirely different. They will occure, but they will never have the same magnitude as quakes due to plate movement. The unloading will generate a new level of elastic strain which will be released at certain zones as moderate earthquakes until a new equilibrium is reached. Hi prok! Good to see you chime in. I meant 'obsessed' in the best possible connotation! Is there a sub-thread at CS where all the relevant pieces would be stored together? What would be the best terms to use to do a search on this topic? Nearly half of Greenland’s mass loss occurs through iceberg calving, but the physical mechanisms operating during calving are poorly known and in situ observations are sparse. We show that calving at Greenland’s Helheim Glacier causes a minutes-long reversal of the glacier’s horizontal flow and a downward deflection of its terminus. The reverse motion results from the horizontal force caused by iceberg capsize and acceleration away from the glacier front. The downward motion results from a hydrodynamic pressure drop behind the capsizing berg, which also causes an upward force on the solid Earth. These forces are the source of glacial earthquakes, globally detectable seismic events whose proper interpretation will allow remote sensing of calving processes occurring at increasing numbers of outlet glaciers in Greenland and Antarctica. "Will climate change in the Arctic increase the landslide-tsunami risk to the UK?" This is a major multi-year collaborative study focusing on the possibility of Storegga-type landslides happening as a result of Arctic warming. My interest in this is personal, as Newfoundland is also included in the study area. We know about landslip tsunamis in this corner of the Atlantic: in 1929, the south coast of Newfoundland suffered a tidal wave associated with an earthquake-landslip on the continental shelf. The 1929 event may or may not have been linked to climate change, of course, but it is very interesting to see that scientists are interested in finding out what the effects of climate change might be for the ocean floor up north. This BBC article sets out the issue in layperson's terms. Besides cc effects on earthquakes, it seems that very slight reductions in the speed of the earth's rotation can cause dramatic increases in the number of severe earthquakes globally. This was new to me. I saw that about likely earthquakes and the slowing of earth's rotation in 2018. I wonder if it's true? In general, I feel we're in enough trouble without promoting extreme views, but this didn't look fake and the Guardian is normally trustworthy; however, I'll wait and see and take a look at the comments on the article. OK, I took a look. I don't know this commenter either (one tropic2), but it is grounds for caution. OTOH, we know that a lot of things that seemed exaggerated a few years back are coming true. Over the past decade, Bilham has predicted that the Himalayan region is ripe for several giant earthquakes greater than magnitude 8, and cautioned that any one of these could kill more than a million people in the densely populated urbanised Gangetic plains. A senior Indian geophysicist who knows Bilham well said his research and style of making presentations in India may have irked sections of senior scientists. “I have had a good working relationship with him, but he’s regarded by some as a scaremongerer,” said Bal Krishna Rastogi, director of the Institute of Seismological Research in Gandhinagar, which hosted the workshop. For everyone including me who wondered why the earths rotation speed changes slightly, I did a bit of Googling. It appears that gravitational influences from other planets have an effect. "The Earth's rotation around its axis, and revolution around the Sun, evolve over time due to gravitational interactions with other bodies in the solar system. The variations are complex, but a few cycles are dominant" https://en.wikipedia.org/wiki/Milankovitch_cycles BUT It also seems that weather has an effect ( NASA) AND actual Earthquakes themselves affect the earths rotation speed. Wonderful stuff. Somebody also pointed out that the recent nuclear tests in Pyongyang (and I saw there was some seismic activity originating in northwest Russia or thereabouts recently as well) can't be helping. Finally, there are also tidal variations in rotation rate and polar motion caused by the near-equilibrium long-period tides, which have periods from about 9 days to 18.6 years. For rotation rate, the dominant contributor is in fact the solid-earth tides." I imagine the sea floor deformation discussed here will result in some interesting events, including earthquakes and vulcanism. Nice abstract and to me it makes sense. I imagine that when the Earth first captured the moon, it caused unimaginable earthquakes. Overtime the tug of the moon probably reshaped the Earth. The Earth movements were very fast at first, but slowed down overtime as the gravitational forces met limits imposed by the composition and shape of the planet and the orbit of the moon. Overtime that change reached the sort of equillibrium that we experience in our time frame. I believe it is perfectly posible, even likely, that at some point in the future some tipping point is reached that changes the equillibrium of the moon and Earth and the phases of the moon do become correlated with Earthquakes. However, that may be hundreds of millions of years into the future if at all. An intense earthquake centered in the Gulf of Alaska has prompted tsunami warnings and watches for the Alaskan, Canadian and U.S. West Coasts, as well as the Hawaiian Islands, just after midnight Tuesday. The magnitude 7.9 quake struck at 1:32 a.m. PST about 175 miles southeast of Kodiak, Alaska, or about 350 miles south of Anchorage. Tsunami warnings have been posted from Alaska's Aleutian Islands to the British Columbia coast, including Vancouver Island's outer west, central and northeast coasts, southeast Alaska's inner and outer coasts. Tsunami warnings mean a tsunami with significant inundation is possible or already occurring in these locations. “If the ice melts, that can destabilize the magma,” Guðmundsson says. In the months that followed, Katla’s earthquakes diminished as the threat of eruption fizzled out. But the possibility of enormous ice caps melting, releasing pressure, and contributing to volcanic eruptions remains. And with the world warming and glaciers disappearing, the possibility of powerful eruptions to come is growing. Storegga submarine landslides may be more common than originally thought. Shetland Island (north of Scotland) has been hit by at least two more tsunamis in the past 10,000 years than previously thought, and scientists are working to identify where the giant waves originated. Around 8,200 years ago, the Storegga off the coast of Norway caused a 20m-high tsunami to sweep across Shetland. Sands found at various points across the isles, and in mainland Scotland, Norway, the Faroe Islands and Greenland, proved the tsunami's towering height, and the event has been well-reported. Scientists funded by NERC have identified sands on Shetland that they say prove additional tsunamis hit Shetland 5,000 and 1,500 years ago. This could mean that tsunamis are a more common occurrence than previously thought in the UK. ... We found sands aged 5,000 and 1,500 years old at multiple locations in Shetland, up to 13 meters (42 feet) above sea level. These deposits have a similar sediment character as the Storegga event and can therefore be linked to tsunami inundation. ... Submarine landslides can occur on slopes of just one or two degrees, and we still don't know exactly how they are set in motion, except that earthquakes are considered to be the most common trigger. It is critical that we learn more. The research is part of the Landslide-Tsunami project, ongoing research that forms a key element of NERC's Arctic Research Programme. The project aims to discover what causes enormous submarine landslides, what the impact of slides in different locations and of different magnitude would be on the UK, and what the likelihood of such an event might be, given the significant scale of Arctic climate change. A major 7.0 magnitude earthquake has struck Alaska, causing people to run from buildings and briefly prompting a tsunami alert for coastal areas. The quake was centred about seven miles (11km) north of Anchorage, the largest city in the state, according to the US Geological Survey (USGS). A series of aftershocks was recorded following the initial shock, which had a depth of 40.9km, the USGS said. Around 300,000 people live in Anchorage with 100,000 in the surrounding area. This area is prone to earthquakes. The damage appears to be minimal. I was there for the big one, but was too young to remember. That's a very strange occurrence. Tic, count to 17 slowly, then Tock. I'm always intrigued by questions that no one has the answer to. Cross-posted from the Oil and Gas thread. ... scientists eventually agreed that it could only have originated from a volcanic event, one involving the movement of a vast volume of magma beneath the seafloor, causing the ground there to significantly deflate. Now, a new paper by researchers at the French Geological Survey and France’s Ecole Normale Supérieure has been uploaded to the public server EarthArXiv. Although there are plenty of unanswered questions, this first-order estimation of what happened between May and mid-November matches up with the calculations of those geoscientists that took to social media. In fact, the volume of magma involved is so huge that this is certainly one of the largest offshore volcanic events to be spotted by modern scientific instrumentation. According to the data from the onshore GPS stations, as well as the seismic signals—including the weird November 11 event—the rumbling is definitely being generated by volcanic activity of some sort. The way the ground on Mayotte is moving implies that the seafloor off its eastern shoreline is sinking at a rate of around 0.4 inches per month. At the same time, Mayotte itself is shifting eastward at a rate of 0.63 inches per month. Both indicate something huge underground is on the move, causing some serious deflation. The nature of these tremors suggest that the magmatic source is centered at a depth of 16 miles beneath the seafloor. In the first six months of the sequence alone, at least 0.24 cubic miles of magma has shifted around. That’s roughly equivalent to 385 Great Pyramids of Giza. There is even an ecological element to the story that’s currently unexplained: the emergence of lots of dead fish offshore from Mayotte. Krakatoa threw into the air nearly 5 cubic miles (21 cubic km) of rock fragments, and large quantities of ash fell over an area of some 300,000 square miles (800,000 square km). There have been no major ground rupturing earthquakes along California's three highest slip rate faults in the past 100 years. A new study published in Seismological Research Letters concludes that this current "hiatus" has no precedent in the past 1000 years. U.S. Geological Survey researchers Glenn Biasi and Kate Scharer analyzed long paleoseismic records from the San Andreas, San Jacinto and Hayward Faults for the past 1000 years, to determine how likely it might be to have a 100-year gap in earthquakes across the three faults. They found that the gap was very unlikely—along the lines of a 0.3% chance of occurring, given the seismic record of the past 1000 years. The results emphasize that the hiatus is exceptional, and that the gap isn't some sort of statistical fluke created by incomplete paleoseismic records, said Biasi. The analysis also indicates that the next 100 years of California earthquakes along these faults could be a busy one, he noted. "If our work is correct, the next century isn't going to be like the last one, but could be more like the century that ended in 1918." "We know these big faults have to carry most of the [tectonic] motion in California, and sooner or later they have to slip," said Biasi. "The only questions are how they're going to let go and when." 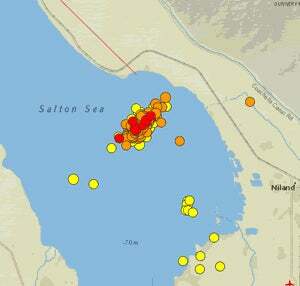 A series of quakes under the Salton Sea may be a signal that the San Andreas Fault is on the verge of buckling. For the next few days, the risk of a major earthquake along the fault is as high as 1 in 100. Which, holy crap. The swarm is located near a set of cross-faults that are connected to the southernmost end of the San Andreas Fault. Troublingly, some of these cross-faults could be adding stress to the San Andreas Fault when they shift and grind deep underground. Given this region’s history of major earthquakes, it’s got some people a bit nervous. ... “Swarm-like activity in this region has occurred in the past, so this week’s activity, in and of itself, is not necessarily cause for alarm,” cautions the USGS. That being said, this is only the third swarm that has been recorded in this area since sensors were installed in 1932, and it’s much worse than the ones recorded in 2001 and 2009. This particular stretch of the San Andreas Fault hasn’t ruptured since 1680, and given that big quakes in this area happen about once every 150 to 200 years, this fault line is considerably overdue. Should the Big One hit, it won’t be pretty. Models predict a quake across the southern half of California with a magnitude around 7.8. Such a quake would cause an estimated 1,800 deaths, 50,000 injuries, and over $200 billion in damage. I listened to a podcast from KPCC about prepping for a big quake. Very informative.